Thanks to all our prospective students and their parents and guardiins for attending our Open Night last Tuesday. 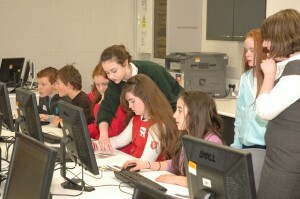 We were delighted with the big turn out and the feedback from students and adults as to the changed format this year. We hope you enjoyed looking at the facilites and sampling some of the many subjects that is on offer here in Gallen CS. It has been a very busy week for the producation crew, cast and TYs involved in all aspects of the producation of our musical “Beauty and the Beast”. The posters are up, the programme is printed and the cast are been put through their paces by Mr Mac Cartáin and his team. All is left for you to do is to ensure you have your tickets bought. they are selling out fast, Thursday and Friday night is almost sold out but there is still some tickets left for Tuesday and Wednesday nights. We wish all the the cast and everybody in the Production a wonderful success with our annual school musical. This week saw the beginning of the Third and sixth year Mock Examinations and we wish them every success with their exams. It is a great opportunity for them to get a chance to complete exam papers under exam conditions and we wish them all well.